I’ve recently made some goofy Doctor Who–inspired photo-manipulations and mash-ups for my Christopher Jones Comic Art Facebook page. If you don’t follow my page and haven’t seen them there (and why DON’T you follow that page? Give me a “like” for Pete’s sake! ), I thought I’d post a few of them here. This was the first one, inspired by a gag in Asylum of the Daleks, the Doctor Who Series 7 opener. 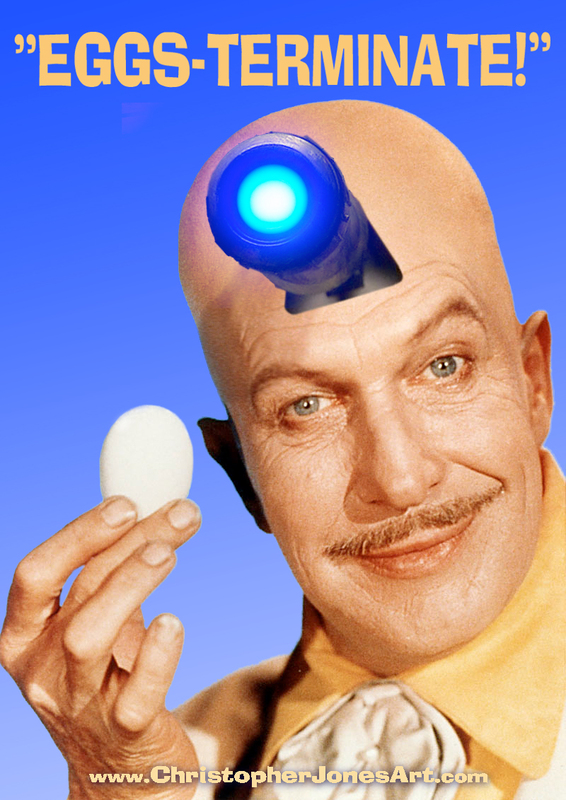 I’ve always loved Vincent Price as Egghead on the Adam West Batman series, and when the thought popped into my head, this seemed too fun not to visualize. And yes, that’s the Batman credits font I used in the piece. 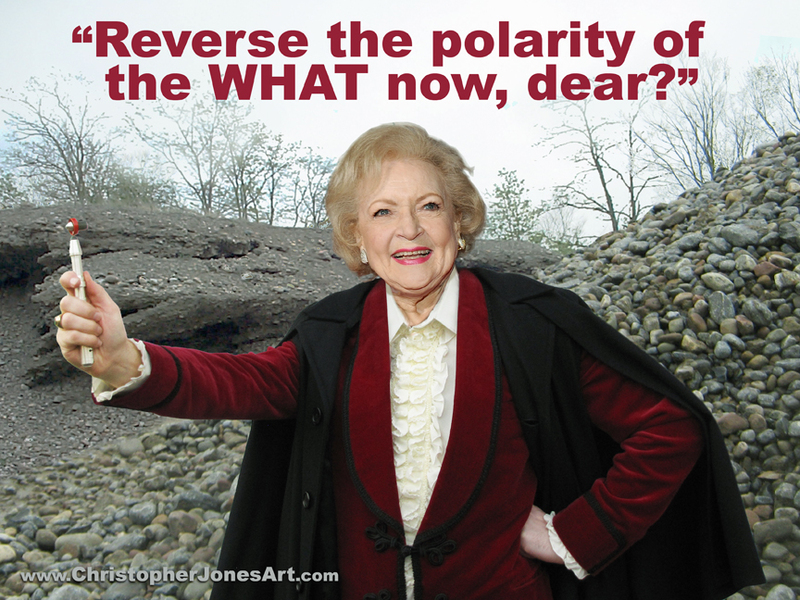 Then I went kind of nuts and for no good reason did a photo manipulation of Betty White as the Third Doctor. There’s no real connection there, other than possibly the hair. 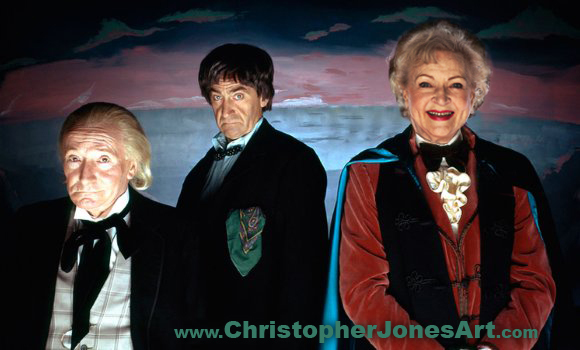 While I was looking for a good Betty White photo to use for that last one, I found a photo of her underlit, which inspired me to also work her into one of the Three Doctors publicity photos. I also slapped the following phrase on a found, otherwise unaltered image of Doctor Who writer/producer Steven Moffat on the set of Time Crash, the 10th Doctor/5th Doctor crossover that was done for charity. Because as often as the TV show reminds us that Rule #1 is “The Doctor lies,” the real Rule #1 would seem to be that Moffat lies about his plans for the show! 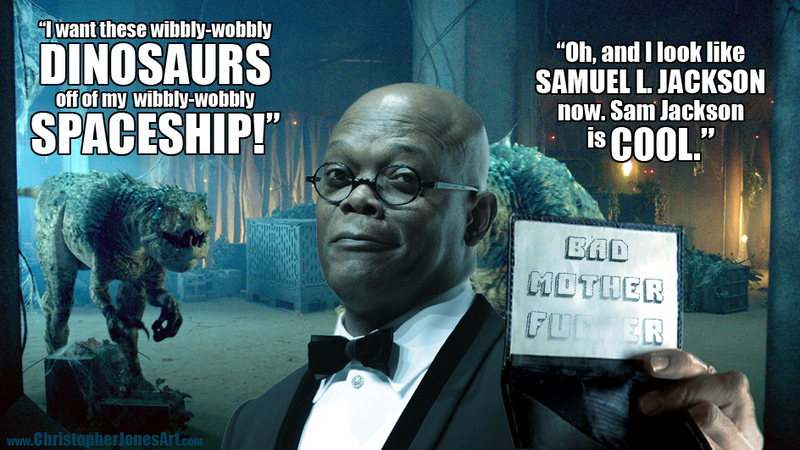 And finally, the second new Doctor Who episode of the season is titled Dinosaurs on a Spaceship, the title of course referencing the cult Samuel L. Jackson movie Snakes on a Plane, which inspired me to create this, which is probably my favorite of these photo-manipulations to date! So the recent flap over a possible Doctor Who feature film seems to be a disconnect between the BBC’s Film Division and it’s Cardiff-based Television Division, and is being fought in public by wanna-be Who director David Yates (Harry Potter) and current Doctor Who showrunner Steven Moffat (Doctor Who, Sherlock). In short, David Yates wants to “revamp” Doctor Who, making it a big film franchise with big-name actors and a recast Doctor. Steven Moffatt says any Doctor Who feature film would be made in cooperation with the production team of the TV show and the current television Doctor. This got me thinking about whether *any* Doctor Who film would get me that excited. Peter Cushing as "Doctor Who"
We’ve heard talk about a Doctor Who feature film for years. There have been two of them, made in the 1960’s starring Peter Cushing as the Doctor and the films were made at the height of Dalekmania and are direct adaptations of the first two Dalek stories from the TV show. Peter Cushing is marvelous as the Doctor, but the movies make odd changes to the relatively simple premise of the show that hadn’t yet grown into the massively complex mythology it is today. The Doctor is actually named “Doctor Who”, and is an earth-born scientist who built a time machine in his back yard that looks like a police box for no particular reason. These films could serve as a lesson in the pitfalls of a Doctor Who a feature film out of continuity with the TV series. Tom Baker and Ian Marter tried to get a Doctor Who feature film made in the 1970s but it never happened. And there have been countless rumors and genuine attempts at a feature film since then. (You can read about many of these attempts in the book The Nth Doctor.) Most of these were in the time before the 2005 relaunch of the show, when Doctor Who was either a television series of very (ahem) *modest* production values, or was off the air entirely. The thought of seeing Doctor Who return and on a big budget seemed very exciting, but I was always worried that such a production would lose the quirky, whimsical tone of the show. Well in 2005, thanks to Russell T. Davies and company, Doctor Who did return on a big budget, but it was on television. We got 13 new adventures of The Doctor per year (plus a Christmas special), with production values surprisingly lavish for television, shockingly lavish for British television! And the sometimes-dramatic, somtimes-silly, always-clever tone of the show had evolved into something faster and snappier for the 21st century, but it was most certainly intact! So what do we need a feature film for? Sure the scale could be made grander still, with even more action and bigger stars. But does Doctor Who need that? This is a show that has always been more about great characters, clever stories and witty dialog than epic action. Why do a featrue film given what we’re getting on television? Well I figured it out. I know what I want in a Doctor Who feature film that would deliver an adventure the TV show could never give us, and with all due respect to Mr. Yates he’s not the one who can deliver it. Let Pixar make it. Can you imagine a Doctor Who feature film with the strength of story and character, the sense of design and the action of The Incredibles? Or Monsters, Inc.? I realize that a partnership between the BBC and Disney/Pixar for such a film is unlikely to the point of absurdity, but most of these rumored Doctor Who films weren’t ever going to happen. Let me at least fantasize about the one I’d want to see! 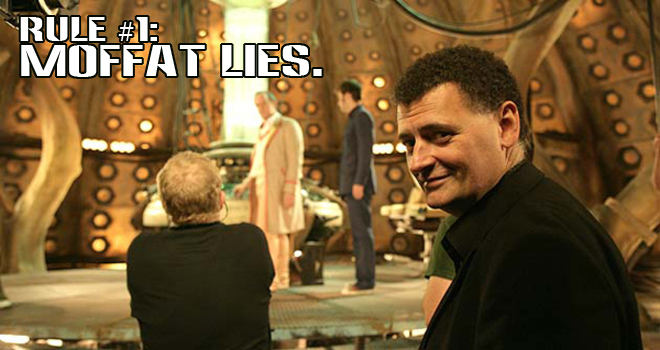 Oh, and letting Steven Moffat help with the script probably wouldn’t be a bad idea. 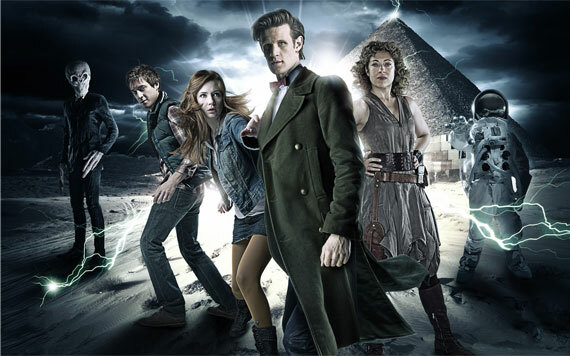 Doctor Who | Christopher Jones | December 18, 2011 2:40 pm | Comments Off on Doctor Who: The Movie?